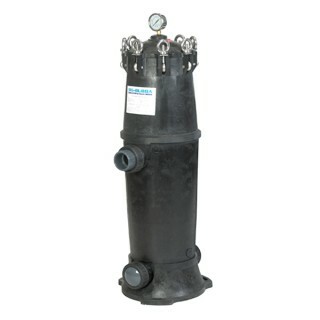 The Watts BBH-150 High flow Filter Housing (150 GPM) is a water filter housing for Watts Jumbo Cartridge Water Filters. This cartridge filter housing is constructed with durable, glass-reinforced polypropylene, ideal housing for high flow rates or chemical compatibility issues. This high flow filter housing ensures quick and easy cartridge replacement for your convenience. This industrial filter housing can be used in multiple filtration applications, including whole house, commercial, industrial, and more. Full line of proprietary cartridges with double o-ring seals for superior sealing. Big Bubba filter housing are made of rugged, glass reinforced polypropylene so they will not chip, rust or dent and because all wetted surfaces are non-metallic, they are ideal when chemical compatibility is an issue and for sea water applications. Big Bubba filters are an economical replacement for stainless steel filtration equipment because of their non-metallic construction and today's high cost of stainless steel! Big-Bubba filters are an economical replacement for stainless steel filtration equipment because of their non-metallic construction and today's high cost of stainless steel. Big Bubba filters have two outlets on opposite sides to allow for more flexibility with piping configurations. Filter may be installed inline or piping may come from the same direction. A plug is provided for the outlet, if not used.